We've got a great new feature in Tracker Mobile, the on-site data capture system within asbestos software Tracker and Alpha Tracker. Here's a 20 second video to explain - get in touch if you want this feature in your system! Quality Manager Kim had an intensive day yesterday with our Lloyds' ISO9001:2008 assessor to review our compliance with this tough Quality standard. I'm really pleased to announce that we passed the inspection day with 0 non-conformities identified, a real credit to Kim and the rest of the team here at Start Software. We're now working on moving to ISO9001:2015, the latest standard, whilst also working towards our ISO27001 accreditation. As an aside, as far as I know we're still the only asbestos software company with this approach to Quality - it takes us time, energy and money to achieve the standards but it is worth it because of the service it enables us to provide to our clients. For more info, see http://robinbennett.blogspot.co.uk/2015/10/iso90012008-inspection-visit-at-start.html and http://www.start-software.com/about-us/certifications/. We've updated our Tracker Upload Manager and Alpha Tracker Document Maker modules again to improve photo processing. These are two of the modules that form part of our Tracker and Alpha Tracker asbestos software systems. You can download the updates from our web site or contact the support desk for more info or if you need assistance. We're really pleased to announce that asbestos specialists SB Asbestos have received their Alpha Tracker asbestos software training today. Company Principal Julian Wilshaw is a long-time friend of our company and is an expert in the field of asbestos detection and management. 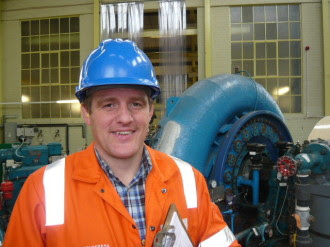 We're delighted that he's chosen to implement our web-based Alpha Tracker system within his own business. Julian and team will be using our asbestos data collection system Tracker Mobile on his tablet to collect and transmit asbestos records, photos and plans back to Alpha Tracker. Trying to get the most of Alpha Tracker? Need any extra training? Or extra manuals or YouTube training videos? We've had a busy couple of weeks creating extra training guides for customers who are using our asbestos software Alpha Tracker in "unusual" ways. Some of this extra training material has been printable PDFs and sometimes it has taken the form of YouTube "how to" videos (like the one below). Would you benefit from something similar? Perhaps you're expanding quickly and need to bring your new staff up to speed? Get in touch with our Support Desk and they will be able to discuss what we can do for you. 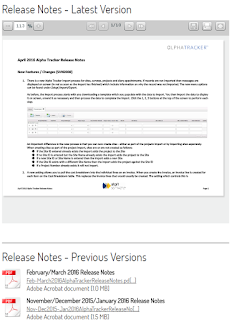 The April 2016 update to asbestos software Alpha Tracker is now available for download. Known as SVN2000, this update has 100 new features, bug fixes and performance updates since the Feb/Mar release. Please note: You need the very latest version of the Alpha App Server on your system in order to deploy this update so please do contact us before installing so we can double-check that you are set-up and ready to take advantage of all of the new features. We took just under 500 support calls in April and 88% of these were queries which were resolved in the timescales set by our customers. For high priority problems, over 95% were solved "in time" matching our performance in March. This is pretty impressive given the rapid expansion of our asbestos software Alpha Tracker customer based since January and so we have lots of calls being generated by new users finding their way around the system. We are delighted to announce that asbestos specialists Envirosurv have gone live with asbestos software Alpha Tracker this week after completing their training. Envirosurv's impressive accreditations underline their commitment to quality and their investment in asbestos software Alpha Tracker will help them to improve their service even further.